The LRFC Club and Community Indoor Training Centre was officially opened by HRH The Princess Royal in July 2015. It consists of an indoor 3G pitch (accredited for both rugby and football) which measures 38metres by 18metres, a strength and conditioning suite (Gym), two full size changing rooms with showers and toilets and an accessible toilet and shower room. Our introductory charging structure is effective from 1st March 2015 to 29th February 2016, when charges will be reviewed. There is one significant difference between charges for our older established facilities and charges for the new indoor training centre – charges for the established facilities are not subject to VAT, whilst the charges for the new indoor training centre are subject to VAT. 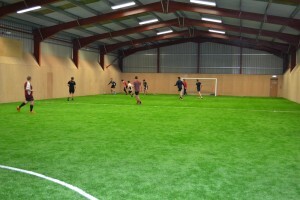 The 3G Pitch may be booked, either on a block basis for up to 8 weeks, with a “first refusal” rebooking option, or on a unique event basis. To enquire and/or book, contact the Clubhouse Manager either at clubhouse@lrfc.club or on 01506-845087. Unique events are subject to an additional £5 charge on each of the above hourly rates. Individual players associated with a block booking will automatically become temporary facility members of the Rugby Club for the days covered by the block booking. Gym membership is open to all members of the community over the age of 18. The facility is open 24/7, with access controlled by an electronic system supported by CCTV monitoring and recording. Each individual is booked in for a safety induction and basic training before being given an electronic access fob (£5 deposit). Linlithgow Rugby Football Club has two full size grass pitches, which are occasionally available for hire, at the discretion of the Club Executive Committee. Other community sports’ clubs or organisations are welcome to apply to become Affiliated Club members – please contact admin@lrfc.club for further information. Linlithgow Rugby Club has recently made a huge investment in facilities as part of a drive towards being a thriving and sustainable community club. This has been supported by a number of grants including one from sportscotland. The rugby club was re-founded in 1970, after a brief existence in the 1920s, and has established itself as a community club open to all. We are proud of our heritage – our formation is strongly linked to West Lothian Cricket Club – and of the hard work of our founding members in 1970 and their successors in the early 1980s and 1990s who established and then developed the club at our present home at Mains Park. In line with our recent investment we are revising our club constitution to emphasise the potential for affiliation with other sports’ clubs and community organisations and we have reviewed our charging structure for use of our facilities, to enable others to access these facilities at fair rates while ensuring that our overall operations are sustainable in the long term. As a community club any surplus we make is reinvested in our facilities. We want our club to be at the heart of the community and for our clubhouse to be a place of welcome for all. As an amateur club, largely run by volunteers, this represents an on-going challenge!